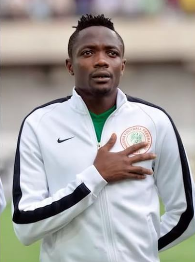 It appears all is well between Ahmed Musa and CSKA Moscow coach Viktor Goncharenko, with the Belarusian naming the Nigeria national-teamer in the starting line-up for the eleventh game in all competitions on Sunday afternoon. The Leicester City loanee repaid the faith shown in him after scoring a crucial equalizer for the Muscovites in their 1-1 draw with Ufa at Stadion Neftyanik. CSKA trailed 1-0 at the interval to Dmitri Sysuev's 41st minute opener off an assist from Dmitriy Stotskiy. With twelve minutes remaining, Ufa defense failed to clear their lines properly and the ball broke to Ahmed Musa, who blasted home from close range. The CSKA number seven put in a full shift unlike the last round of matches that he subbed out in the 58th minute and refused to shake the hands of the manager. In the provisional Russian Premier League standings, the Army Men are fourth with 45 points from 25 games, while Ufa with 35 points are sixth. Ufa's Nigeria international Sylvester Igboun logged ninety minutes, teammate Kehinde Fatai was on the bench for the entirety of the game.